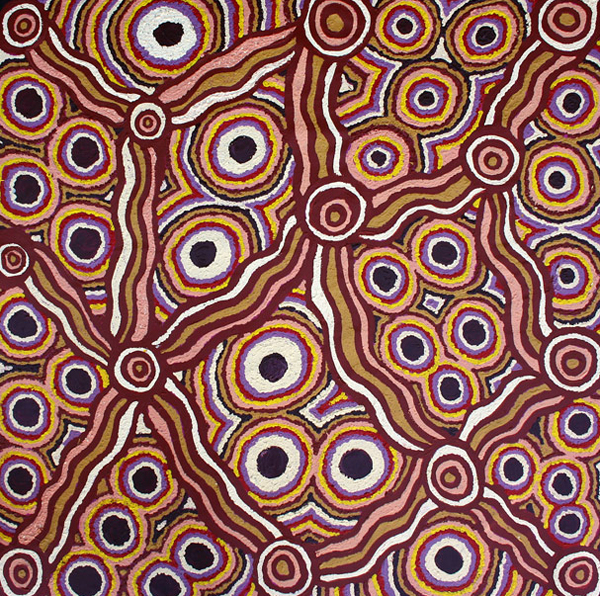 Ina’s painting describes the epic Tjukurpa (dreamtime) story which is central to Anangu cosmology. The story is about the Seven Sisters’ journey across the land, being pursued by Wati Nyiru (a man called Nyiru). This painting illustrates the rockholes and claypans that the Seven Sisters create. Between the rockholes the women travel along a dry creek bed and dance as they go. They sisters flee earth to the skies where they can still be seen as the Pleiades constellation. Wati Nyiru chases them and can still be seen pursuing them across the skies in the constellation of Orion. Inawinytji’s paintings are often influenced stylistically by Milpatjunany – drawing in the sand, which is a way of passing on traditional knowledge about law and culture as well as about country. Survival meant knowing and understanding every aspect of living off the land and in particular the food and water sources. Visual representation through sand drawings give clarity to the stories through images. The circles in this painting represent rockholes and the lines between them the dry creekbeds used as paths by the sisters.